One of the great things about following a family band is you get to watch the kids mature into their proficiency and personality, and one good thing about the Anderson Family is they lack the hokiness or cultish feel you can find sometimes in the family band concept. Yes, the kids are home schooled, but they are not some unusual version of a hyper-religious family, nor are they anti-religious either. They are just people, and their music is fiercely real. They are the same on and off the stage. And the honesty of their love for each other and the music is unbelievably infectious and uplifting. For years it was easy for your attention to gravitate to Paige, the front person of the band. Female flat picking guitarists are so unbelievably rare to begin with, and Paige’s adeptness with the discipline is matched in slickness by her sublime and saccharine voice. 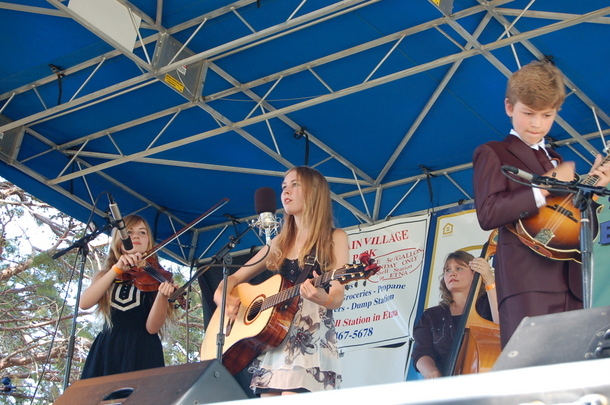 But when seeing the Anderson Family perform live this weekend at the Scott Valley Bluegrass Festival in Etna, CA, just the improvement in all the players from previous seasons was spellbinding in its own right. Maybe worth noting the most is how Paige’s younger sister Aimee’s singing had acquired this confidence that allowed it to meld with her siblings with such ease. Every one of the Anderson Family kids are highly proficient pickers, but Ethan, aka “Bo” Anderson may turn out to be the instrumental savant of the clan while giving up no ground in his ability to hold up his side of a harmony. The 13-year-old stole the show when he sat in with the David Thom Band on the weekend. 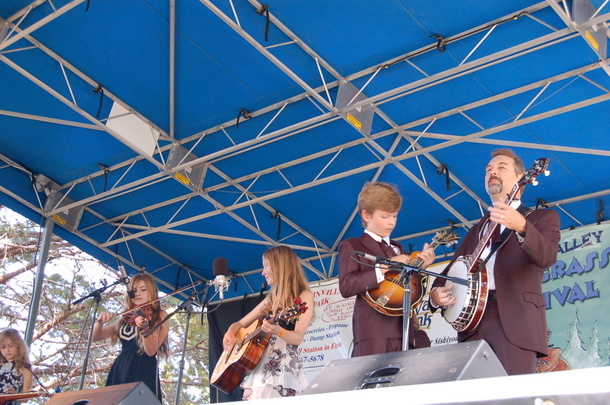 To see a 13-year-old stand in on a full set of hard-charging bluegrass music completely unrehearsed proves that the Anderson Family are not just programmed, they are proficient way beyond their years. And Daisy, my word. The youngest sibling drew the loudest hands of the weekend, with both her vocal prowess, holding out he part on the song “Ruby” (see below) for an inhuman amount of time, fitting right in with the challenging harmonies of her older sisters, and handling her breaks on the dobro better than most players who are her age squared. With that much talent and drive, mom Christy Anderson on upright bass, and dad Mark Anderson on banjo are just happy to keep up. But what’s always the challenge with child performers is if the originality is going to develop. Sure, learn the modes of music and how to move your fingers as fast as you can, but will there be soul? Can you write a song? The Anderson Family already exudes a lot of originality in the way they arrange their traditionals and covers and how they handle their solo breaks, but with Paige Anderson now writing her own material, this adds a whole new dimension to the music. 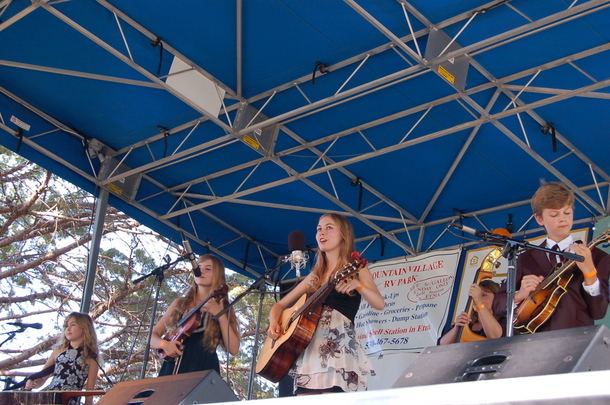 Within the Anderson Family Bluegrass Band, and in Paige’s spinoff with sister Aimee and brother Ethan called “The Fearless Kin”, Paige is developing her own independent roots style with a bluegrass backbone, inspired by folks like Chuck Ragan, and Possessed by Paul James, both of which The Anderson Family has shared the stage with before. Paige just graduated high school, and wants to pursue music as a career full time. She’s hoping to release the EP some time this summer. 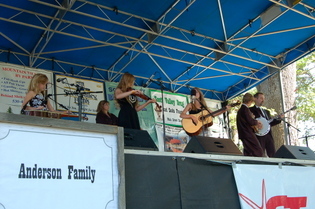 I went to the Scott Valley Bluegrass Festival hoping to catch the Anderson Family’s set and shake their hands, and the Anderson Family ended up making me feel like one of the family for the weekend (Trigger Anderson, if you will). The music is excellent, but this is just the excuse to get you to pay attention to the profound warmth and by-gone family strength the Anderson Family conveys. Their strength and authenticity is inspiring, and stays with you after the last note has rung and the last hand has been shaken. Sure, like any family, the Anderson’s have their struggles, but they are also an example of how fulfilling life can be when your priorities are simplified into family and artistic expression. with Del McCoury and Marty Sturat the headliners did the call the show off? FANTASTIC! I got goosebumps singing along to The Legend of D Ray White. Good stuff. Always something special that comes along with family acts. This is great stuff. The new progressive string bands like Trampled by Turtles are a lot of fun too but it’s especially awesome to see a new generation carrying on real bluegrass traditions. ive been a fan since your first post on the andersons. i really love the harmonies its what really makes them standout to me as a life long beach boys fan. 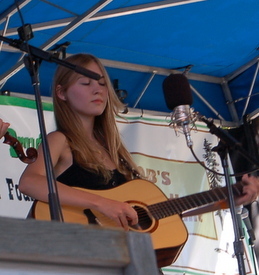 there are some videos on youtube of just paige flatpicking and shes really an amazing player. What has happened to Daisy, I do not see her on a lot of the new Video’s. She is a great player & singer. 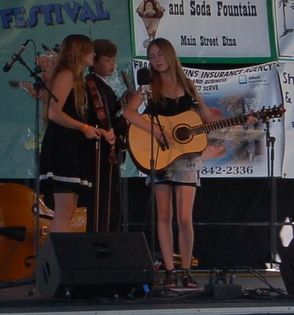 Daisy still definitely performs with the Anderson Family Bluegrass band. However Paige’s “Fearless Kin” does not include Daisy…or at least most of the time. But I have seen her in a couple of videos for that as well recently, and she may play more with them as she grows up, we’ll see. Daisy is also the painter of the family, so visual arts may be her eventual calling.